After the partition of our country, unfortunately the whole Sindh province came under the grab of Pakistan. Thereafter Sindhi Hindus (about 13 lacs, now 60 lacs) the religious minority in West Pakistan, were forced by circumstances to migrate to our main Motherland i.e. India. We were in search of identity to be attached with our hoary history and heritage and the signs and places in rest of India. We found that the Constitution Assembly, at the instance of Pandit Jawaharlal Nehru, judiciously got the name of Sindh retained in our National Anthem inspite of opposition that Sindh province was no more part of India. But Jawaharlal Nehru opposed this vehemently, arguing on the plea “Though Sindh province is not with us but Sindhu civilization is synonymous with the ancient history of the whole of India which is subscribed with the Indus civilization; hence the word Sindhu should be retained. Again on same basis, the Government of India last year opposed deletion of word “Sindh” from National Anthem as advocated by someone in P.I.L. (Public Interest Litigation) filed in the Delhi High Court. 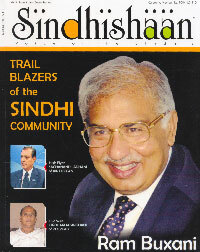 The Sindhi community had a consolation and was jubilant to feel adhered to some of such historical narrations in India. Again in 1996-97, we found that the Sindhu River from which Sindh province got its name, flows 600 K.M. in our country in the area of Laddakh. All Indians in general respect Sindhu River but Sindhis in particular behold with reverence this Vedic River Sindhu. We have been worshiping Sindhu River since ages. Hence the emergence of Sindhu River in Laddakh was a matter of joy and of great sentimental value as we could find the roots of our heritage on India soil too. This is the reason we started celebrating Sindhu Darshan festival in LEH from 1997. The then government of India was kind enough to convert this festival into National celebration under the Ministry of Tourism. Consequently the region of Laddakh and people who were for a long time cut off from the main land, started emotionally and sentimentally coming near us and Sindhis were greeted and welcomed with the slogan of “Jhulelal” in LEH. But unfortunately the efforts are being reversed again by your Cultural Ministry and the name of Sindhu Darshan is being changed to “Sanghaya Khabab Spring Festival” without any reason or any substantial need. By doing this, the sentiments, emotions and symbols of identity of the Sindhi community who left their hearts and hearths are being hurt as they feel they are being treated shabbily in this fashion. Ms. Renuka Chaudhary Minister of Tourism tried to change the name but it was dropped due to the vehement protests by the entire Sindhi Community. Now once again this dubious and non-consequential oriented proposal is being put forward for adoption. We therefore request you to kindly look into the matter and restore the original name of this festival “Sindhu Darshan”. Where sentiments and historical identities with ancient attachments are concerned, unprejudiced and unbiased decisions should be taken by the government.